The goal of the IoT Large Scale Pilots (LSP) Programme is to foster the deployment of IoT solutions in Europe, demonstrate their feasibility and benefits and promote the development of a sustainable IoT ecosystem. The projects design and apply IoT approaches to real-life challenges of high relevance, technology readiness and potential socio-economic impact for Europe. 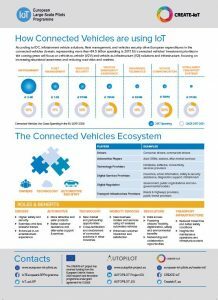 Connected vehicles represent one of the key focus areas in the framework of the IoT LSP Programme. The European Transportation and Vehicles digital journey is moving toward a mobility paradigm centered on multimodal, on-demand, lowcarbon, and personalized travel services enabled by real-time and accurate access to information. 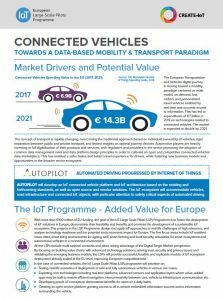 This has led to expenditures of €7 billion in 2017 on technologies related to connected vehicles. The market is expected to double by 2021.